Before you even begin brainstorming topics and creating content, there's some work to do to get your blog set up and running -- the design, settings, comments, social sharing buttons, etc. So where do you start? And how do you know if you did everything you need to do? Refer to this list! It'll walk you through some of the bigger steps you should take when setting up your blog. After that, you can focus on the content and attracting visitors to your blog. Let's get started. 1) Pick a style and template. 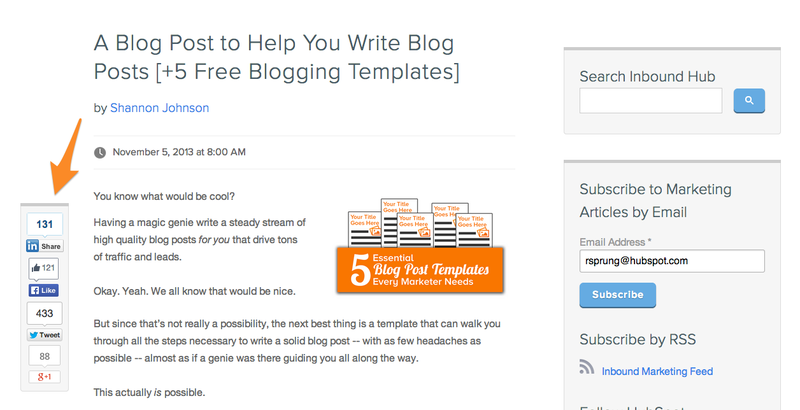 To get started, choose a template for your blog. Your blog content should appear consistent whether you're on the first page or the 100th page. The consistency will give your reader a better user experience because it will be easier for them to navigate the different posts in your blog. 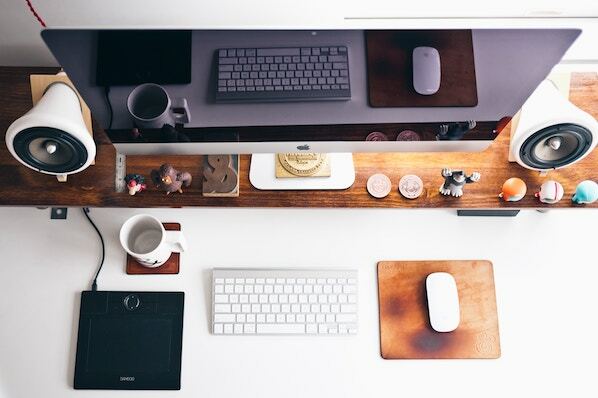 After you finish picking your template, choose a style for your blog. Readers aren't coming to your blog because of the fancy design -- they're coming to your blog because of the content you've created. So don't lose too much sleep over this, and pick a simple style that will help your readers to focus on the content instead of distracting visuals. 2) Prepare your listing page. Your blog listing page is the summary view of your blog posts. Typically a blog's homepage will be the listing page so that when someone visits the blog they see the title, author, image, and preview of the blog post instead of the full blog post listed (think about how much time it would take to scroll through the homepage if it wasn't a preview). As you prepare your listing page, think about how you want it to appear. How much text from your blog do you think it enough for a preview? Do you want a visual in there? Do you want social sharing buttons on the listing page or is it sufficient to have them on the blog post page? Is there any other special formatting you should consider? If you're using the HubSpot COS blog, you can check a box to make sure your blog homepage shows a summary of each article. If you're in Content Settings, click on Blog on the lefthand side. You will then see an option under General that says "Show summaries in listing pages." Make sure that is checked, and you're all set. 3) Set up your tags. When starting your tagging system for your blog posts, you're setting a precedent for your blog posts to come. You shouldn't have hundreds of tags on your blog, even if you think you have hundreds of topics to cover. Choose the least amount of tags that you need to cover your bases. You can always add more blog tags in the future, but you cannot delete them -- as that could affect past content that you have tagged. For example, let's say your blog is about cooking techniques. While you could have tags such as crock-pot, slow cooker, strainer, mixer, it may make more sense to have a more general tag called appliances if you aren't going to write about crock-pots or slow cookers more than a few times. Even though it is more general, it will apply to multiple blog posts and will prevent you from having 10+ tags on various cooking appliances. 4) Create blog author profiles. Whether you're working with other bloggers at your company or working with guest bloggers, having author profiles set up is a great way to attribute your posts but also give some SEO value. 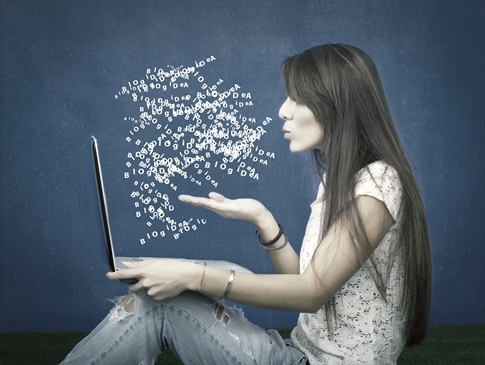 Your blog author profiles shouldn't be paragraphs long, but having a few sentences on the author and how to find them on social media is a good best practice when it comes to blog author profiles. 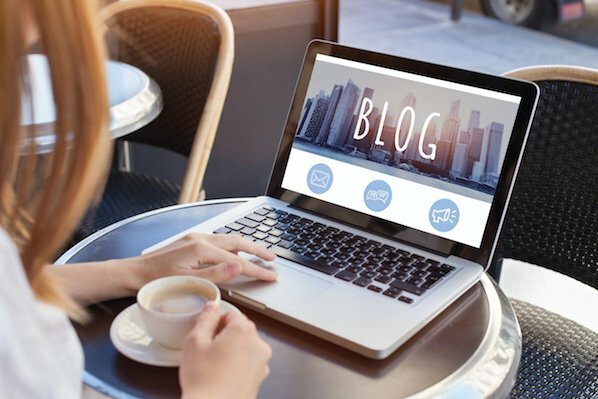 If you're using the HubSpot COS blog, you can create your author profile that will also be connected to your Google+ account. Once you're in the Blog tool, click on Manage Authors, and you will see an option to Add an Author. Fill out the information, and then click on Update Author Profile. 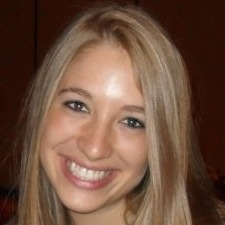 Having your blog author profile complete on HubSpot will allow you to tie your Google+ profile to your blog posts. Once your authorship is authenticated (which can take up to several days), your image will appear next to your blog post on Google search results. 5) Decide how you want to handle comments. Before you publish your first blog post, you need to decide how you want to handle comments. There are a few different approaches you can take. Allow comments on all blog posts. This will allow you to let anyone comment on your blog without being moderated first and without requiring a CAPTCHA. Note that this doesn't mean that you cannot delete comments that are spam after they are posted. Approve comments before publishing to blog posts. This setting makes sure that the blog author reads and approves the comments before they're posted publicly on the blog post. Close comments after a certain number of days. This will set a time limit for when your blog readers can no longer comment on certain posts. For example, if you close comments after seven days, blog commenters cannot comment on the 8th day. Receive comment notifications. This will make sure you do not miss a comment on your blog post. Notifications will let the blog author know when someone comments on their post. Set a level of comments. if you have threaded comments available on your blog, you will be able to directly reply and interact with your comments 1-on-1. In addition to figuring out the logistics of your blog comments, it's also important to figure out who is going to respond to these comments and when. 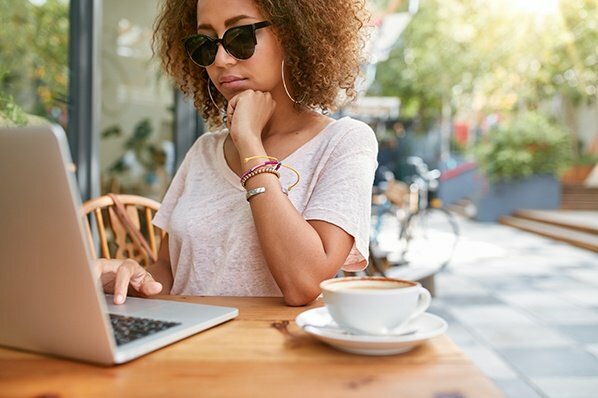 Decide if it makes the most sense for the blog author to respond or another designated person (like the blog editor, or your community manager). Consider how quickly you want responses to your comments posted. There is not a right or wrong answer to any of these options, but setting up your plan before your blog content is public is valuable. Subscriber forms allow your readers to quickly provide their email address and the frequency at which they want to be notified about new posts (this is typically instantly, daily, weekly, or monthly). 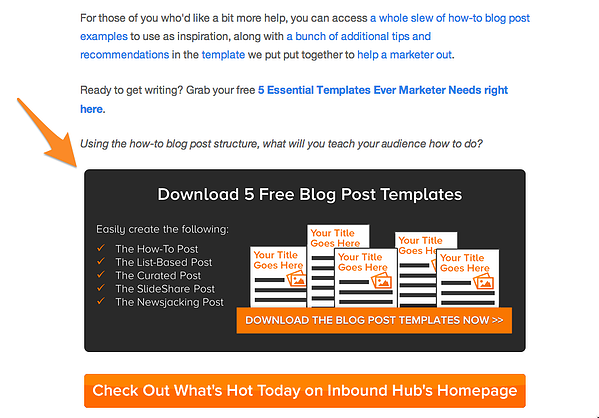 On this blog, HubSpot makes it very easy for their subscribers to sign up for email updates. In addition to a CTA at the end of each blog post, there is an easy signup link on each individual blog post and the homepage. 7) Finalize your subscriber emails. After your subscriber forms are set up, it's time to create your subscriber emails. Depending on the frequency your subscribers choose, they should receive different emails. There are a few things you should keep in mind when creating your subscriber emails. Make sure the email is sent from a name they recognize. This will ensure that they actually open the email with the blog content. Don't include the entire blog post in the email, especially when it comes to weekly subscribers. Put enough preview text that the reader will open the blog post, but not too much text that it's overwhelming for the receiver. Use CTAs that entice the reader to click into the post to read more. That could mean a clickable title or a CTA telling them to read more. Don't forget to write a welcome email to thank your subscribers for signing up to read your blog. Read this post to discover other best practices to setting up your subscriber emails. 8) Set up and manage your subscriber list. As you finish prepping your subscriber emails, take a look at your subscriber list. Does the list include people who actually want to receive updates from you? It's important you keep your subscriber list clean. If someone didn't ask to receive updates when you have new content on your blog, don't send it to them. Like any email list, regular maintenance is critical. 9) Put social sharing buttons on blog posts. Just like it's necessary to make it easy for blog readers to subscribe to your blog, it's important to make it easy for them to share your content on their social networks. As you set up your blog, make sure to add social sharing buttons into the template. This will ensure that whenever you publish a new blog post, there are social sharing buttons that allow your readers to post your blog content to their social networks. This will help you expand the reach of your blog to new audiences. 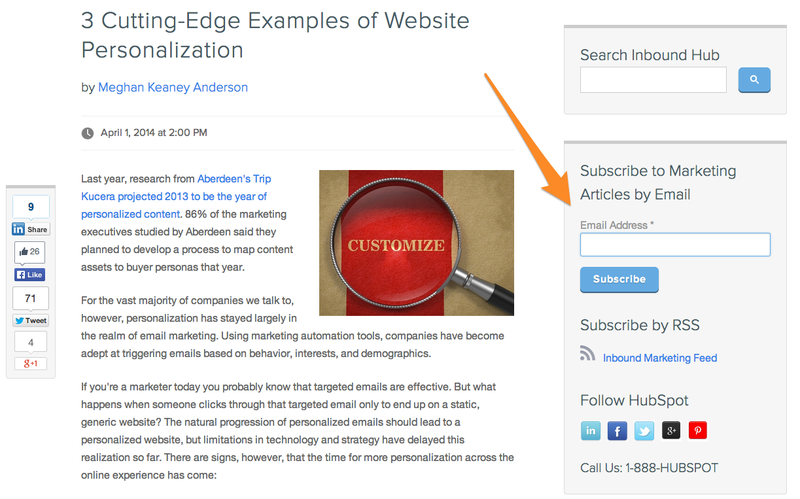 Note: If you have the HubSpot COS blog, social sharing buttons are automatically added to all of your blog posts. Before you start creating content on your blog, think about the path you want your blog visitors to take after they finish a post. Is there an additional piece of content they should read? Is there another page you want them to view? Whatever it is, creating calls-to-action to get them there is important. After you figure out the next steps that someone should take after reading a blog post, create CTAs to put on your blog posts that direct the reader to either another form of content, or the next page you want them to view. This extra step will be key in taking blog readers, and converting them to subscribers, leads, and customers.